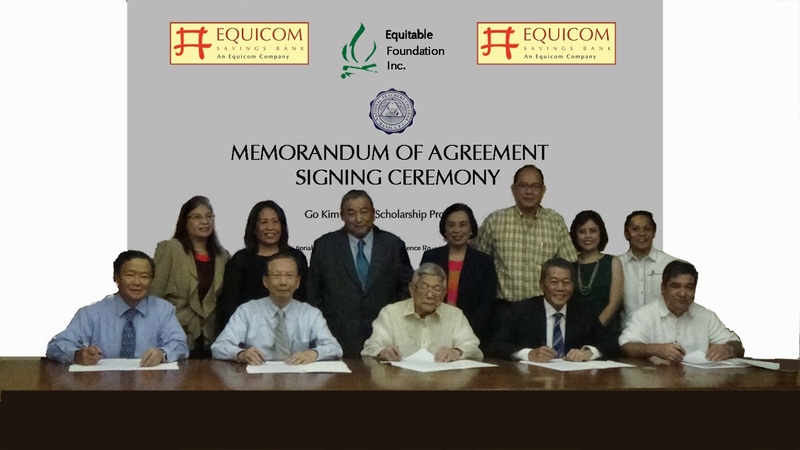 The Equitable Foundation, Inc., a non-stock, non-profit corporation and member of the Equicom Group, has partnered with National Teacher’s College (NTC) to support students pursuing a Bachelor’s Degree in Accountancy. Starting from the 2015 – 2016 school year, qualified students will be beneficiaries of the Go Kim Pah Scholarship Program that will pay for their education starting with their freshman year until their graduation. Seated from the left: Rene J. Buenaventura, Equicom Group vice chairman, Antonio L. Go, Equicom Group chairman and trustee of Equicom Foundation, Inc., Jose L. Arguelles, NTC vice president for Finance, Dr. Oscar Jose Y. Arguelles, NTC vice president for Corporate Management, Alan David L. Matutina, EqB president. Standing from the left: Elena Aguila, NTC Accountancy Program head, Dr. Marlyn J. Mabalot, NTC Dean of College of Accountancy and Business, Roberto P. Ang, executive director of Equitable Foundation, Inc., Antonina M. Cabuyadao, EqB senior vice president and Branch Banking Group head, Dr. Bonifacio P. Bairan, NTC vice president for Academic Affairs, Grace Ayessa C. Bernabe, NTC Scholarship Committee head, and Orlando R. Javier, vice president, area head of Metro Manila II, and branch head of EqB Legarda Branch.